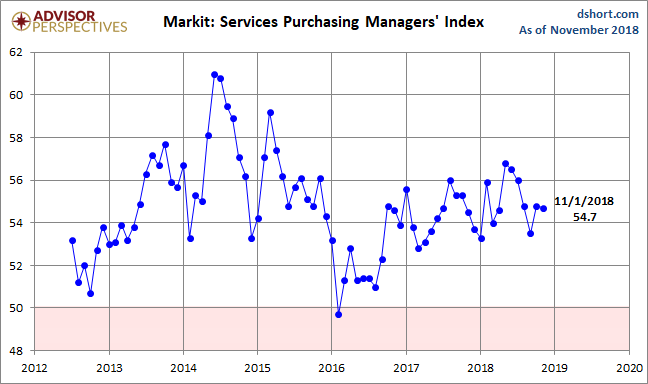 Markit Services PMI: "Slowest New Business Growth Since October 2017"
The November US Services Purchasing Managers' Index conducted by Markit came in at 54.7 percent, down 0.1 from the final October estimate of 54.8. The Investing.com consensus was for 54.7 percent. The Investing.com consensus was for 54.4 percent. 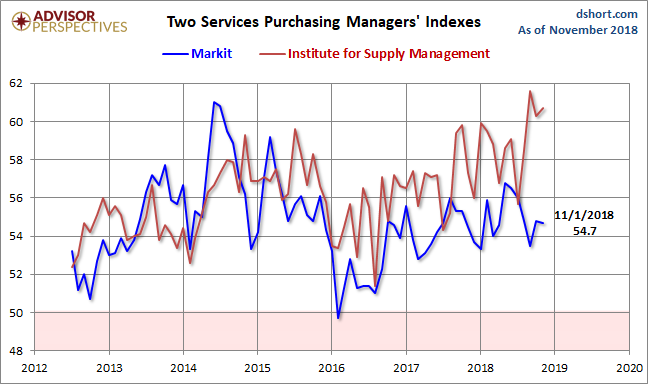 Markit's Services PMI is a diffusion index: A reading above 50 indicates expansion in the sector; below 50 indicates contraction. Commenting on the PMI data, Chris Williamson, Chief Business Economist at IHS Markit said: “The PMI surveys paint a picture of an economy growing at a solid annual rate of 2.5% so far in the fourth quarter, and continuing to add jobs in impressive numbers. Although some cooling in the rate of job creation was seen in November, the surveys are still pointing to payrolls growing at monthly rate of around 185,000. “The surveys therefore add to evidence that the domestic economy remains in good health, generating balanced growth across both manufacturing and services and increasingly outperforming other major economies.